A 5 is Against the Law! : Social Boundaries: Straight Up! 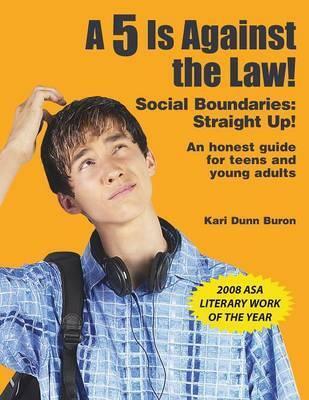 Building on Kari Dunn Buron's popular The Incredible 5-Point Scale, this book takes a narrower look at challenging behaviour with a particular focus on behaviours that can spell trouble for adolescents and young adults who have difficulty understanding and maintaining social boundaries. Using a direct and simple style with lots of examples and hands-on activities, A 5 Is Against the Law! speaks directly to adolescents and young adults. A section of the book is devoted to how to cope with anxiety before it begins to escalate, often leading to impulsive and unacceptable behaviour. Throughout the book, the reader is encouraged to think about and create his own behaviour on an anxiety scale that applies to his particular emotions and situations. ?This is a great practical guide that will facilitate insight into social conventions and regulations. As a result of completing the activities, a person with ASD will be better able to avoid causing offense or getting into trouble with the law..." -- Tony Attwood, Ph.D., clinical psychologist "The Asperger's Syndrome Clinic, Australia"